About thirty young people from the U.S., Canada, Brazil, and China recently descended upon Beaver Falls, Pennsylvania for the 2018 Youth Leader Conference (“YLC”). While the RPCNA has hosted denominational YLC’s in past years, they were previously focused on high school youth. This year’s YLC was open to youth age 18-24. 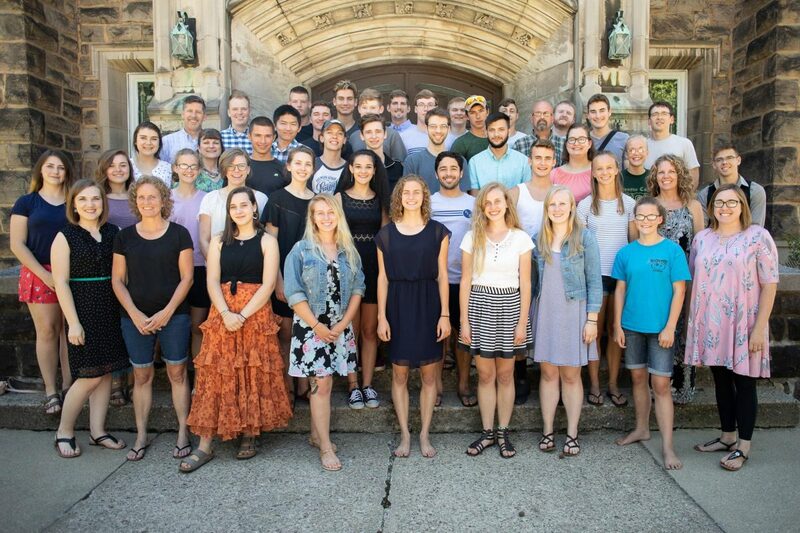 From July 5-9, on the campus of Geneva College, the youth enjoyed stellar teaching, Psalm singing, recreation, and hearty fellowship. Free time included a variety of events including kick-ball, volleyball, soccer (or is that football? ), and Irish dancing. While some of the youth already knew one another from previous youth events (like TFY or Presbytery youth retreats), everybody made new friends. Andrew Quigley from Scotland (soon to be Ottawa, Canada) gave four talks challenging the youth to abide in Christ as they sought to be leaders in the church, in the workplace, in the home, and elsewhere. This abiding in Christ was summarized into three key areas of focus: dwelling in the Word, bathing life with prayer, and Christ-like obedience. Times of discussion following these sessions revealed how seriously the youth took these challenges. In addition to Quigley’s talks and the discussions that followed, YLC also included twelve workshops (youth had opportunity to attend three of the twelve workshops). These workshops were led by various Reformed Presbyterian ministers and members from western Pennsylvania. Topics included hospitality, discipleship, personal & corporate prayer, depression & suicide, a Christian response to suffering, gender & sexuality, holiness & entertainment, Biblical finances, corporate worship, reading the Word, competing worldviews, and involvement in the life of the church. YLC is put on by the Youth Ministries Committee of Synod (“YMCS”), and this represents YMCS’s first concerted effort to specifically focus on older youth in the RPCNA. While the RPCNA has a plethora of retreats, conferences, and programs for its high schoolers, members of YMCS were concerned that not much in the way of denominational conferences are specifically offered for college-age youth. Feedback from YLC participants reflected significant appreciation for the conference, and a desire to see more conferences in the future. As youth departed from the conference, they were challenged to consider how they might implement what they learned into their day to day lives and in their home congregations. Christ has assured us He will build His Church, and we ask you to join us in praying that these youth would unreservedly give themselves to the work of His Kingdom.